This sermon prepares for the February 3 sermon. 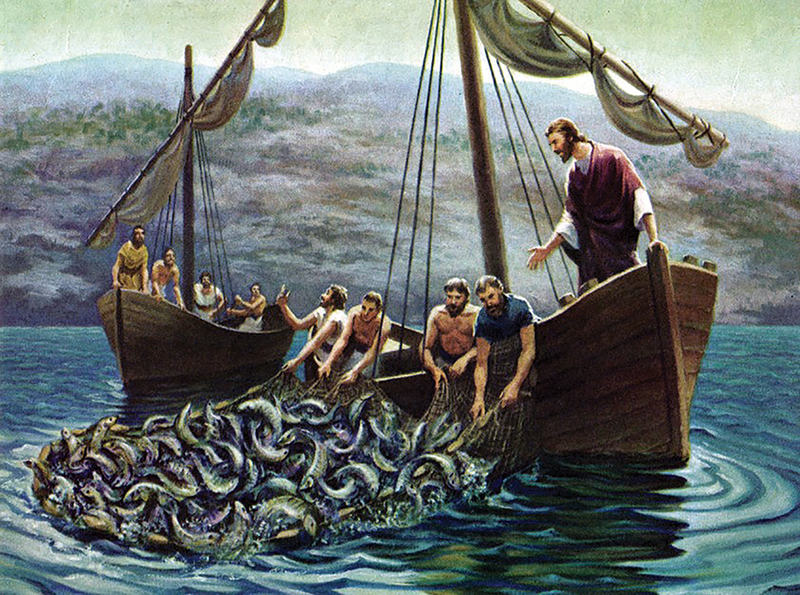 In a story about fishing, Luke leads us into a question about what caused the disciples to leave their occupations in order to follow Jesus. Monday, February 4. Read John 21:1-14. 1) This setting takes place after the resurrection of Jesus. What was he doing here? 2) What did he tell the disciples to do? 3) What fellowship takes place with his disciples and what does it resemble at other times in Jesus’ life and ministry? Tuesday, February 5. Read 1 Peter 1:3-5. 1) How does Peter say we now live as disciples of Jesus? 2) What about the life of discipleship makes it so valuable to u? Wednesday, February 6. Read Philippians 3:7-8. 1) How did Paul consider as a disciple of Jesus the things he once thought were valuable? 2) How did Paul regard his life and ministry for Jesus? Thursday, February 7. Read John 12:23-26. 1) What is required for a seed to become a stalk of grain? What are the implications of this for discipleship? 2) What is the outcome of a life that is selfishly lived? Friday, February 8. Read Mark 8:34-35. 1) What did Jesus tell the crowds they must do if they wanted to follow him? 2) What is paradoxical about the requirements of discipleship? Saturday, February 9. Read Luke 5:1-11. This is Sunday’s sermon text. Dear Father, we are inspired by the stories of Peter’s acceptance of Jesus. In the beginning there was a lot he didn’t understand, but it did not keep him from walking away from his boat. Be with us so that we will be willing to walk away from our boats as well. To follow you. To trust you. To believe that you alone have the answer to a meaningful life. In Jesus’ name. Amen. We’ve allowed our modern definition of faith to be drained of depth and turned into a shallow kiddie wading pool of little more than mental assent. Many of us have heard that said “a jillion times” — well, maybe not “a jillion,” but you know what I mean. But, what is genuine faith, saving faith, the faith of the first disciples? Really, what does it mean to believe? I ask because I fear our definition of faith has left us shallow; little more than faint reflections of the Lord we say we follow. So the promise is received by faith. It is given as a free gift. And we are all certain to receive it, whether or not we live according to the law of Moses, if we have faith like Abraham’s. For Abraham is the father of all who believe…This happened because Abraham believed in the God who brings the dead back to life and who creates new things out of nothing (Romans 4:16-17 NLT). Abraham’s example of faith is the convicting reminder that we’ve made faith into something it never was. We’ve allowed our modern definition of faith to be drained of depth and turned into a shallow kiddie wading pool of little more than mental assent — something we believe between our two ears but do not allow to call our hearts to open to others and our hands to serve as Jesus served. That kind of faith is too wimpy when compared to Abraham’s faith. Jesus calls us to faith in God, Abraham’s God, Israel’s God, the God who miraculously delivered and worked through Abraham and his descendants to bring us to Jesus. This is true faith in YHWH, the great I AM, the true and living God “who brings the dead back to life and who creates new things out of nothing.” This is faith in God who re-creates us (2 Corinthians 5:17) to be like him (Ephesians 4:24). He transforms us a little more each day to be more like who he was in human flesh, Jesus (2 Corinthians 3:18). He takes our shallowness, our pettiness, our fearfulness, our short-sightedness, our selfishness, our weariness, our brokenness and transforms us into little “Jesus live-a-likes” — because that is what a disciple is (Luke 6:40). Sound too hard or too edgy or too demanding or too “un-churchified” or too simplistic? Think again. Remember how Paul described the faith that saves us? For what I received I passed on to you as of first importance: that Christ died for our sins according to the Scriptures, that he was buried, that he was raised on the third day according to the Scriptures, … (1 Corinthians 15:1-4). Sounds a whole lot like the faith of Abraham who believed in the God “who brings the dead back to life and who creates new things out of nothing”!